Andrew Cowen looks forward to the first gig in 15 years by Birmingham’s space rock band, Omnia Opera. Aah, spacerock. The thrum of a low frequency osillator, flanged guitar chords, girly whisperings and the stench of patchouli. The sound of Hawkwind at the Fairfield Hall in 1972. You know the score. Midlands-based space rock legends Omnia Opera will be performing their first gig in Birmingham in over 15 years on Saturday. Following succesful performances at Hawkfest 2007 & 2008 (and with an upcoming support slot for Hawkwind in Wolverhampton on December 10), Eastern Haze & Sonicworld festivals, as well as other select gigs in the UK, this is a rare chance to see a legendary energetic and out-there performance from one of the country’s longest established and most enigmatic psychedelic rock bands. 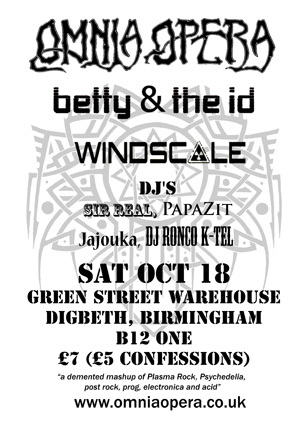 Taking place in the suberb Green Street Warehouse venue, the night’s entertainment will consist of three live bands, Omnia Opera, Betty & The Id and Windscale, and promises to be “a demented mashup of plasma rock, psychedelia, post rock, prog, electronica and acid”. There’s a full bill of DJs including Sir Real, Papa Zit, Jajouka and DJ Ronco K-Tel. Visual stimulation and lighting installations will be courtesy of the mighty Catweasel. So that’s three live bands, four DJs and much visual enhancement, the night is dedicated to plasma rock, psychedelia and general weirdosity. Doors open at 8pm, the evening kicks off at around 8.30 with the sonic circuit bent instrument madness that is “Windscale”. This is followed at approx 9.30 by “Betty & the Id” with a healthy dose of psychedelic garage inspired beauty. Omnia Opera take to the stage at 10.30 to infect the gathered throng with their brand of ‘Plasma Rock’. The night is lubricated inbetween bands with aural ear candy supplied by DJs Sir Real, Papa Zit , DJ Jajouka and DJ Ronco K-Tel who will carry the nights events way off into the early hours, all live music should be over by 11.45pm. Plasma rock veterans and original “Space Bastards”, Omnia Opera headline the evening ..influenced by the likes of Gong, Hawkwind, Cardiacs & Zappa, Omnia twist, mix up and spew out their own take of the genre, for a listen check out Omnia Opera on Myspace. Windscale create music using mainly circuit bent instruments, along with processed guitar and bass. Crazy business, if you’re not sure what circuit bending is, or what Windscale might sound like, check em out on the Windscale Myspace site... Awesome weirdness, just what the doctor ordered. As for the DJs, Sir Real has been bending the ears and minds of dance subculture for over 15 years with a convoluted selection of techno, electro, breaks, house and a plethora of other genres, some yet to be invented. But he won’t be doing any of that for this special event, oh no. Instead you can expect a demented mashup of psychedelia, post rock, prog, alt country, electronica, acid, and much more...you can try and dance if you like, but make sure you bring your spare leg. Papa Zit is a stalwart of the Birmingham music scene, with involvement over the last 20 years on stage (with proto electro/rock crossover freaks Bagman), behind the scenes (as MC and general facilitator at House of God), and lurking in pretty much every dark musical corner that you could care to mention. A man of wildly eclectic tastes he will be bringing, as he might say, ‘much weirdness’. And you can’t say fairer than that. DJ Jajouka is another long-time participant in the Birmingham musical underground. From the early heady rave days of Bedlam, via the hugely popular and influential Third Eye Soundsystem nights, to the bent comedy & variety of Club Unlikely, he has been subverting and entertaining in equal measures all the way through. Now a self confessed music junkie, his collection eclipses all that comes before it for sheer breadth and scale. But more importantly, his knowledge and appreciation of extremely strange music is vast. So expect to hear much that you have never heard before, and indeed much that you are unlikely to hear again (at least in this life). You will also witness a rare appearance from DJ Ronco K-Tel, who has been torn away from a Spanish villa to provide curios of the sonic kind for your delectation. Visual stimulation and lighting installations will come courtesy of the mighty Catweasel. He has worked for just about every club night and band in Birmingham over the last 15 years or so, and more recently has provided material for such varied clients as Stevie Wonder, The Modified Toy Orchestra and The X-Factor! However, his heart and roots lie in truly psychedelic lighting and computer-mangled video, and for this event he will be pulling out all the stops to ensure that your eyes receive just as much of a treat as your ears. Live music will finish by approximately 11.30 to facilitate those who are travelling by public transport - the evening will then go into party mode, handing over fully to the resident Djs for the evening.